After a hectic seven day straight work week in Beijing and Nanjing, we got home last night to Shanghai ready for some serious R & R. Don’t get me wrong, we stay in nice hotels and love seeing different cities but there is nothing like being able to go to your own kitchen for a snack and our Slumbermax memory foam mattress=heaven! Though it takes a VPN and more patience than I can muster, I was able to catch up on episodes of Nashville on HuluPlus while munching on Girl Scout cookies. Wild Saturday Night in the George house! Sunday dawned with sun and mild pollution so we were anxious to get out and enjoy the spring day. As we headed to the gym, I think every kid was out playing and driving their parents crazy in the common areas of our complex. 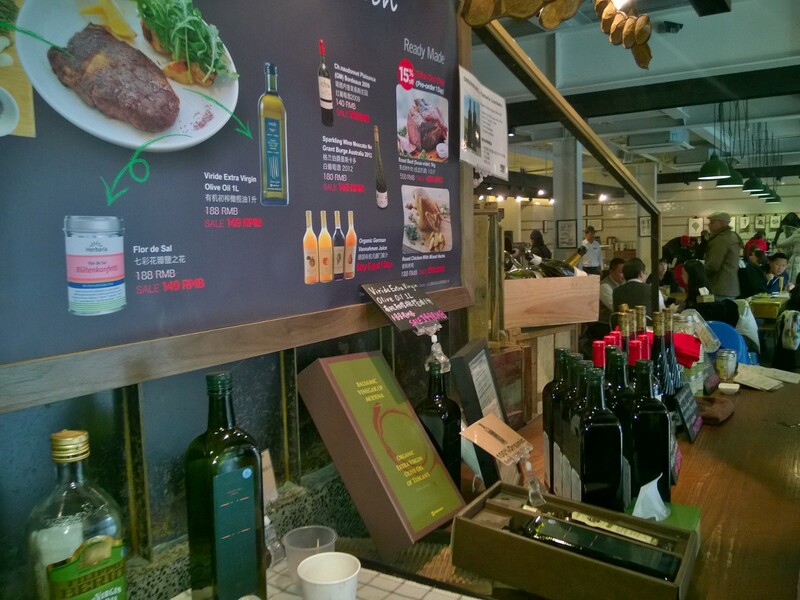 After gym and church, we started to wander around the former French Concession and stumbled into expat central. I have never seen so many Laowais milling around especially at the grocery/wine/deli called Green & Safe. What a great descriptive title, right? 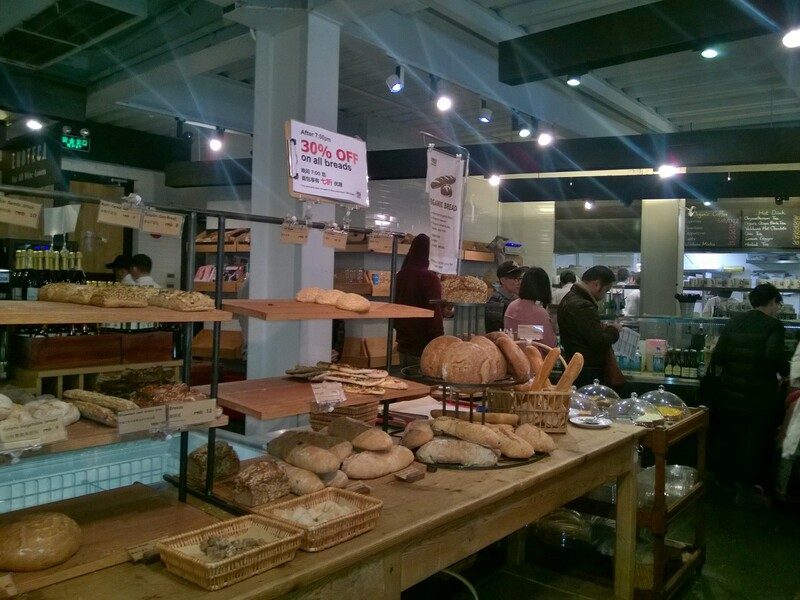 In polluted Shanghai where food safety is questioned at even the nicest places, some genius built an oasis where organic stuff sits next to a carb wonderland with fresh baked breads and pies/tarts/oh my! The salads, soups, sandwiches and pastas were gorgeous and tasty. Yes, it was very green and hopefully safe. Of course, it is China so you just never know but you can always hope. If I’m not sick within an hour of eating, I consider myself lucky. Thom had a Pink berry lemonade with lemon & mint-very refreshing and healthy and not the slightest bit girly or anything. I sipped on the free, pour your own sample sparking wine. So I’m thinking the owners might want you to only have one sample but I was thirsty. Since this is an easy walk from our church, I think we have found our new Sunday brunch spot. Free wine samples and all that green & safe food. I feel healthier already. The inside is very concrete, wood, stone, hipster styling. We sat at the ledge looking out into the street and played guess the nationalities of the customers–French, German, Italian, etc. were all there. A busy week again for me with a work retreat for a few days and then off to Hong Kong, so I had to work in a mani and shopping to look good. Nothing like light blue nails and a few new outfits from Gap and Zara to gain some confidence and energy. Of course, I wear the largest size they carry at the Gap so THAT was depressing–yep, size 8 is the BIG size here in China. They carry XXXS, which I didn’t even know existed in sizing. As I walked home in the dark along the quiet streets in Pudong, I reflected on how safe I felt. I would never walk alone in downtown Seattle after dark. Of course, after the train attack with crazy machete-wielding terrorists indiscriminately chopping away at innocent people and the possible plane going down due to terrorists, I am starting to feel some apprehension as I travel around a country that will definitely have to strengthen their safety procedures to prevent future problems. Here’s hoping for that! Wand me, pat me down, scan my stuff and do it with diligence and attention to detail with everyone PLEASE! Heard you were in Seattle while we were on Maui. Hopefully, we’ll be in town your next time returning to the Pacific Northwest. Lauren sends her best from Bonnie Edinburgh. We will be swinging through Seattle on the way to meet our new granddaughter, Mia, when she arrives on 5/9 or thereabouts. We’ll have to get together to tell stories. Tell Lauren the guest suite is ready for her in Shanghai-she would love it here! Take care. Haha OMG I would hate shopping at that Gap. How is xxxs a thing? Just go shop at Gapkids. I think they honestly carry up to a size 18 at our Gap in Boise.